Build a connection to our World Heritage Site as you visit Banff’s landmarks and view wildlife in their natural winter habitat – Hear how the history of the Bow Valley changed when three railway workers rediscovered a hidden treasure – See and learn about wildlife behaviour, habitat, and their winter survival adaptations – This is Banff¹s best tour for viewing wildlife which are seen on 95% of the tours. 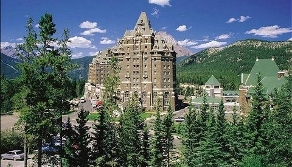 Banff’s best tour for viewing wildlife. We see wildlife on over 95% of our tours.